Short cuff city commuting glove, constructed using Gore-Tex Windstopper outshell fabric combined with hard knuckle protection. Leather palm construction keeps hands protected from the asphalt giving this glove excellent comfortable performance in wet and chilly conditions with ample riding protection. Pre curved construction. 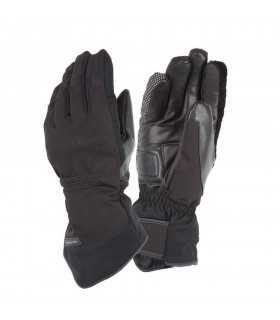 CONSTRUCTION: Lightweight, windproof, and water resistant city riding glove constructed from a GORE-TEX Windstopper main shell for effective insulation. Incorporates full?grain leather palm reinforcements on palm and thumb. SAFETY FEATURES: Over-molded hard knuckle protection provides excellent and abrasion and impact resistance; the protector is subtly incorporated under main shell for styling. KEY FEATURES: Knitted wrist cuff for comfort, snug fit and flexibility. Touch-screen compatible fingertip on index finger for use with GPS systems of smartphones. Textile puller located on cuff for easy on and off. Available in international sizes S-3XL.